Tatty Thinking: "Which way am I facing again?" I'll not lie; I broke myself during that last Marathon attempt. It's why I've not mentioned anything for six months. I thought I had everything covered. I was buying new trainers, I had a colour coded training schedule all drawn up, I had the motivation and I was getting out there most mornings without complaints. But I missed the absolute key to any training plan: INJURY PREVENTION. That's right, folks. It seems glaringly obvious now, of course. I started to feel a sharp tightening pain on the outside of my left knee after a morning run one day, and I thought nothing much of it. A bit sore after I'd been sat still for a while, and really "yeowchie" at times like getting up from the table, but nothing more than a bit of a niggle that would pass with dedication and effort, right? On my way back from a 10mile LSD (Long, Slow, Distance) run I stopped at traffic lights and when I hopped cheerfully off the pavement to cross the road, I thought I'd left my lower leg behind me. The searing pain in my knee was enough to make me shout in pain and I crashed to a halt, both hands hitting the cold pavement in front of me. I fell over?! Oh my God, did I really just fall over? (How embarrassing). Did my leg actually just drop off? It felt like it. I picked myself up, caught a breath, got out of the way of oncoming cars, and started walking the loooooong two miles back home (my leg was still attached). Note to self: always take enough cash for a cab back to your flat...just in case. That "Walk of Shame" was one of the most upsetting 30 minutes I can remember. I cried a lot of the way, and I saw my hopes of crossing a Marathon finish line drift away with each tear. I thought I'd done something seriously bad - I had visions of surgery, long recovery times and eating peanut butter with banana chips, straight from the jar. I felt like I'd put on half a stone just thinking about it. I made an emergency appointment with a sports physio and it was pretty quickly diagnosed as ITBS, Iliotibial Band Syndrome. A very common inflammation of the long band of tissue that runs down the side of your upper leg, connecting your glutes, quads and hamstrings to the tibia and fibula below your knee. Cause? Too much, too soon. The overuse I'd pounded into my poor legs in a short space of time had caused the IT Band in my left leg to swell, snapping at the outside of my knee joint and causing a pain that can only be described as feeling like someone is tightening a screw into the side of your knee. Prognosis and treatment: six weeks of foam rolling/deep tissue massage, a lot of quad/glute/hamstring strengthening and stretching, all teamed with lots of intensive core work to improve the strength and stability in my hips. No running, no swimming, no cycling...lots of rest. Every runner's worst nightmare "No running. Rest." I was missing the bright side - I would run again. And I did. About four weeks after my physio appointment I was out running for between 7-12minutes at a time, and I built things up from there taking plenty of rest days in between. I knew however that my hopes of Marathon glory were out of sight for 2013, and this was the cause of great heartache and many, many tearful episodes on the shoulder of my very patient partner. I felt like I'd let everyone down, and my spirit was crushed. Unwilling to be deterred though, I completed the Edinburgh Half Marathon on 26th May in 2hrs 7mins. Five minutes slower than my 2012 time, but at least I crossed the finish line pain free. Straight to the beer tent, oh yes. Since then, I've been keeping up the foam rolling and core work and I've not even felt a niggle of ITB pain. I'm back up to running for over an hour, out several times a week, and I'm making sure to factor in a strict regime of injury prevention, rest days and dedicated stretching time. Gradually that will increase, but with a couple of 10k races and a November Half Marathon in the pipeline, I'm gently easing myself into the longer mileage to avoid any chance of injury and I'm focusing more on my speed and technique. Additionally, I've been working a lot on adjusting my running style and form. I bought the new trainers...I got some New Balance Minimus 10v2 Road shoes, with Vibram soles. They are very colourful. And yes, I'm slowly making a move to minimal/barefoot running, though don't expect to see me in my bare feet any time soon. The minimal style is just fine for the time being. Plus, people tend to enjoy smashing bottles and vomiting on pavements in Edinburgh...that's before the seagulls swoop in to eat leftover kebabs. I'd rather keep my shoes on, thanks. After reading Born to Run, I was unbelievably inspired to up my game and get back into long distance running. Nothing makes me feel like a run can. I've never been as happy...running is my drug of choice and (for a change) it's good for me. Well, it's better for me than peanut butter and banana chips. Hopefully I can inspire more people around me to try running as not only a means of keeping fit, but also as a way of maintaining a healthy mind and taking time out to spend alone with their thoughts. It's time I spend thinking about myself as opposed to other people, which everyone needs to do from time to time. I had the great pleasure of meeting the wonderful Barefoot Ted earlier in the summer, while he was on a very brief stopover in Edinburgh. 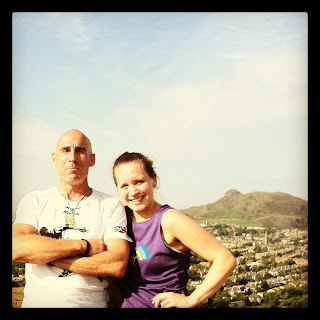 Having been so inspired by Born to Run, I was delighted to be able to go for a run with Ted and several guys from Footworks in Bruntsfield. Typically it was the hottest day of the year so far and I practically melted myself into oblivion running to the top of Blackford Hill with a lot of experienced, fit, male runners. But never one to back out of a challenge, I got there, and it was a great privilege to hear Ted speak of his journey and experience of barefoot running. I usually run around the other hill in the background - it looks so small!! Anyway - that was a truly great day and again it was really inspiring to spend time talking with other runners and sharing our stories. I'm so happy to be part of such a warm and vibrant community. I was also directed to a great website that night by one of the guys we were out running with - the principles of Natural Running are fairly simple, but by factoring in a few of these aspects every time I go out for a run now, I'm certainly feeling more like that "Navajo on the hunt" that Chris McDougall talks about! In the past, people used to move out of my way when they heard me coming from 20metres away...now I'm having to politely body check people off pavements. If such a thing exists. I am a stickler for manners, after all. Today's top tip: Take a day off. If it wasn't already clear enough, I've become a true believer in the power of rest days and appropriate amounts of sleep. Once you're running a lot, it is entirely justified to allow yourself a day to put your feet up and have a wee afternoon snooze where possible. It's a fact that distance runners will need more sleep and that regular rest days (though not too many in a row) will ultimately make you stronger and more resilient as you progress on your running journey, whatever it is you're aiming for. Whether it's 5mins without stopping, or a full blown marathon, rest days are key in preventing injury. You can either listen to me, or you can listen to your miserable whimpering when you hurt yourself from overuse...tough love today, folks. I learnt the hard way. A real beauty for that peaceful rest day. From the album 'Trouble Will Find Me' - listen online here. This week's reading: 'What I Talk About When I Talk About Running' by Haruki Murakami. "I'm running on sheer willpower and the finish line doesn't seem to get any closer. I'm thirsty but my stomach doesn't want any more water. This is the point where my legs start to scream." Hi Nikki, our mutual friend Clare Birkett recommended this blog to me. I had a similar experience with injury and after taking advice from a sports physio and reading 'Born to Run', I also made the switch to natural running. Great that you got to go running with Barefoot Ted, I am going to Vegfest in October to hear Scott Jurek speak.